Patient presented with excess rolls of fat and an undefined waist line. Patient also had fat depositing on her lower back giving a bulging look above her buttock. 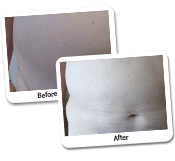 Most of the folding in the skin has been completely removed giving a defined waist line and a flatter lower back. 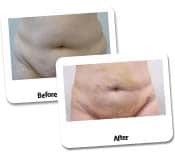 Dr Lanzer has specialised in Liposuction for over 20 years. During this time he has established the safest techniques to be able to perform tumescent liposuction on individuals who would have previously been rejected from having surgery. Tumescent Liposuction can be performed under a local anaesthetic, taking away a lot of possible complications of being obese and having a general anaesthetic. This therefore makes it a safe and attainable procedure. Dr Lanzer commonly divides mega liposuction procedures in to two to three stages. For example, a patient undergoing mega liposuction on the stomach could be at risk of developing a seroma, or fluid collection. Dr Lanzer will often perform mega stomach liposuction in two to three stages to reduce the chance of a seroma developing. 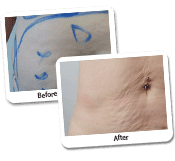 He will generally perform liposuction to the upper area at stage one, then the lower area at a second stage and then the sides if required at another stage. If all is going well with the patient then these procedures can be performed within a couple of weeks. Again, this is quite safe to do so as the patient is not undergoing a general anaesthetic. Many individuals ask us whether they will put the weight back on again after the procedure. Of course you will put weight on if you increase your diet and decrease your exercise, however, Dr Lanzer has found over the years that if patients put weight on, it will tend to go to an area which has not undergone liposuction. For some happy patients this may mean a bigger chest circumference! In saying that, Liposuction always has the best results when combined with a good diet and regular exercise. It is often used as a “kick start” to a patients new regime and new lifestyle. The mega liposuction targets a large volume of fat, so the shape of a patient’s body can change quite drastically after the procedure. However, this does not mean that mega liposuction is a solution for obesity or overweight in general. Patients should see mega liposuction as a kick-start of a lifestyle change, not as a solution to tackle overweight and obesity. So, if you are considering a mega liposuction, ask yourself if you have realistic expectations about the procedure and the maintenance needed after your surgery. Once you had mega liposuction, you will need to maintain a healthy lifestyle to maintain your results and lose any remaining weight you need to lose to reach your target weight; this includes eating healthy and exercising regularly. Weight loss can be more successful if you acquire some professional advice along the way. Fortunately, there are many professionals who can help you on the right path after a mega liposuction and ensure you do not gain the weight back; this includes nutritionists, personal trainers and doctors. By having these medical professionals monitor you, it is less likely for you to fall off the diet wagon and gain the fat back. Naturally, a lifestyle change is always more long term, so you must be willing to make that more long term change before you get mega liposuction! 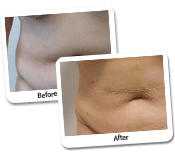 View more Mega Liposuction Procedures Before and After above.